La Journée Internationale de l'Épilepsie aura lieu le lundi 11 février 2019 ! N'hésitez pas à relayer l'information et à cliquer sur les différents liens de l'article ci-dessous. Did you know that International Epilepsy Day is now celebrated in over 120 countries worldwide? In 2019 we are celebrating 'Epilepsy Day Across the World' and so have added an interactive map to the International Epilepsy Day website. This map shares social media messages sent from around the world and shows where they have been sent from! To be involved just share a picture on social media using the hashtag #EpilepsyDay. Make sure you have set your location within your Twitter profile! 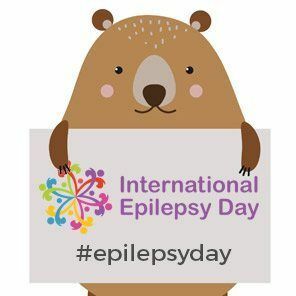 To help you celebrate International Epilepsy Day 2019 we have created a range of posters and social media graphics for you to download and share.You'll also find the International Epilepsy Day logo, social media profile and a template to print out and use in your #EpilepsyDay pictures! available in your own language? If so, please email us a translation of the resource text in your language. IBE Chapters around the world are planning exciting events and activities to celebrate International Epilepsy Day. If you are planning an event please let us know about it, so we can help to promote it! We also love to see your pictures on the day. To celebrate International Epilepsy Day 2019, we recently launched the fourth video in our series featuring Epilepsy Day mascot, Campi the Seahorse. In this video, Campi meets a new friend- Stella Starfish, who also has epilepsy. Stella loves to play football but her team coach is not sure that it’s safe for her to play. Watch the video to find out how she solves this problem, and what she and Campi learn about epilepsy and sports. This latest animation is part of a series of educational stories, specially suited to young children. You can watch more videos featuring Campi on International Epilepsy Day’s YouTube Channel here. You can also download and print a special page to colour in! Does your website link to the International Epilepsy Day website? Please check that your links are to our new address, shown above.